With the Bundesliga season ramping up after its winterpause, league leaders Borussia Dortmund welcomed the relegation threatened 96ers to the Westfalenstadion. Dortmund vs Hannover gave Lucien Favre’s men a chance to increase their cushion at the top to nine points – they took it in style. 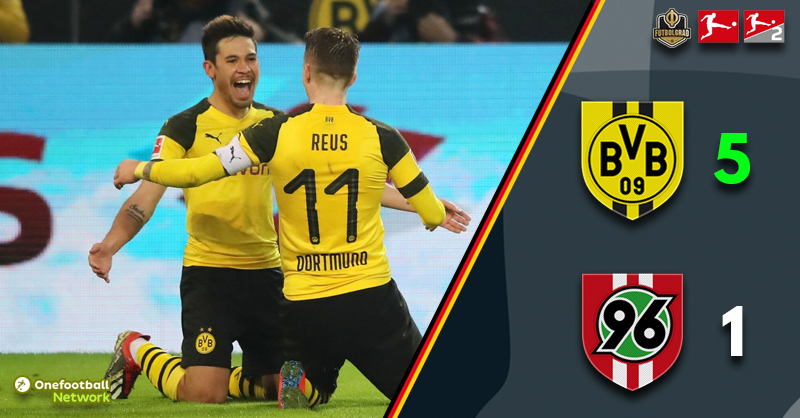 With a well earned victory at Leipzig seven days ago, Dortmund returned to action on home soil as relegation threatened Hannover 96 rolled into North Rhine-Westphalia. André Breitenreiter is very much a man under pressure. The Hannover coach is reportedly on borrowed time and only a positive result could fend off the possibility of his dismissal this weekend. After a positive start from the visitors they were unlucky not to open the scoring inside the first minute. In scenes similar to that witnessed at Fortuna Düsseldorf , Dortmund looked a side half asleep. With barely 60 seconds on the clock, Miiko Albornoz picked out Hendrik Weydandt with a beautifully timed cross. Weydandt’s header looked destined for the bottom right hand corner of the net, but Dortmund’s man of the match in Leipzig last week was on hand to make another wonderful save that denied an almost certain goal. Roman Bürki picked up from where he left off in Saxony, as those in front of him went to sleep the Swiss goalkeeper was the only one alive to the early Hannover attack. The shock of almost falling behind fired Dortmund into life, the Schwarzgelben quickly found their grove. Achraf Hakimi was purring on the left flank and it was thanks to his skill that the hosts grabbed the lead on 24 minutes. Latching onto a Raphael Guerreiro pass, the left back ran at the Hannover defence before he dropped his shoulder and cut in-field. While a pass right looked to be the only option, Dortmund’s wing-back opened his body and drove a rocket towards goal – Michael Esser stood little chance of stopping the Moroccan’s bullet, it was a fabulous opening goal. It should have been the platform for Dortmund to push on – however, the visitors did enough to frustrate the normally prolific Yellow and Black attack. Denying their hosts the time and space to launch their devastating brand of fast flowing football. Hannover looked to have been denied a certain penalty on 35 minutes. Thomas Delaney challenged Noah Joel Sarenren Bazee, television replays showed the Dortmund midfielder missed the ball and stamped on the Hannover strikers foot. Match referee, Manuel Grafe wasn’t sure and VAR didn’t interject – the visitors were furious. Breitenreiter had obviously done his homework on the importance of Axel Witsel to the Dortmund system, as the half time whistle sounded Hannover had frustrated their hosts despite falling behind. The second half started in a similar vein to that in which the first ended. However, for all of Hannover’s hard work it was another woeful defensive error that allowed Dortmund to stamp their authority all of the fixture. Miiko Albornoz inexplicably decided to try and play out from the back whilst under pressure from Hakimi. The opening goal scorer easily disposed the Chilean. His pass found Marco Reus, who delicately flicked the ball over the advancing Esser – if Hakimi’s goal was wonderful, Reus’ was simply divine. Two soon became three as Mario Götze then grabbed his second goal of the season. Jadon Sancho was proving to be a handful for Hannover and it was his pass that found the World Cup winner – the Englishman continues to impress at the Westfalenstadion. Raphael Guerreiro heaped more misery onto die Roten – the Portuguese midfielder added a fourth making it an absolute rout for the home side. Hannover looked dejected and it became a possibility that the scoreline could become an embarrassment. As it was, the visitors managed to restore some pride with an 86 minute consolation goal, Marvin Bakalorz’s shot took a wicked deflection, Bürki was left flatfooted and furious. There was though, just enough time for Dortmund to grab a fifth. Witsel with a long range drive that nestled in the bottom corner thanks to a ricochet off the post. It was an easy victory that sent the league leaders nine points clear, whilst probably signalling the end of Breitenreiter’s tenure at Hannover. Marco Reus reminded everyone just why he is the driving force behind Dortmund’s title ambitions. Back in the side after an absence against Leipzig, the 29-year-old capped a wonderful display with a well taken goal and an assist. His presence is something that not only benefits the league leaders, it terrifies their opponents. The Pokal winner now has the Meisterschale in his sights, and with this type of display it just might be a deserved ending come May. With Dortmund having a far from impressive first half, the denial of a Hannover penalty – for a clear foul on Sarenren Bazee – could have put a different perspective on the entire fixture. Had the visitors gone into the break level, their approach to the second half would have undoubtedly been different. As it was, in the end Hannover were easily dispatched in a fixture that showed just why they are fighting for survival while Dortmund lead the way.